Lucius Quinctius Cincinnatus is one of the archetypes of the Roman republic, summoned from his farm, he led the armies of Rome into battle, won and then resigned his power. That is the figure that has come down to us but it is not, crucially the figure that Livy handed to his successors. Cincinnatus is a much more complicated and interesting figure in Livy- still according to Livy great- but much more interesting than the figure we have. Our figure is a democratic one at its roots- the citizen who can command as well as the highest politician- Livy's argument is not democratic but aristocratic- he uses the story to exalt nobility and to question the values of his own society. His argument is directed against fortune not against the conception of native virtue. I wanted to make that point because it allows us to set the famous incident of Cincinnatus's dictatorship in context. Cincinnatus was not an innocent farmer but a highly partisan political leader- a hammer of the plebs we might say- and a punctilious man for legal precedent and obligation. When Livy tells the story of his dictatorship- that the consuls were defeated and that Cincinnatus was called from his farm to lead Rome's armies and led them to a stunning victory in only fifteen days- we are not to read that as a supplication to the successful spirit of Rome, but rather as an injunction to nobility. (III 26) When Livy says that he wants the 'particular attention of those numerous people who imagine that money is everything in this world' he does not want to tell them that everyone is equal, rather his argument is that money means nothing besides nobility and morality. That the ancient virtues of the Roman patrician will outpace the modern ones of the Roman businessman- this is an argument, familiar to any serious analyst of the enlightenment, about the virtues of aristocracy and commerce. It is significant that Cincinnatus appoints Lucius Tarquitius his master of horse- poor but the best soldier in Rome- the point is being made again in case you didn't get it, that wealth and virtue are not the same (III 27). 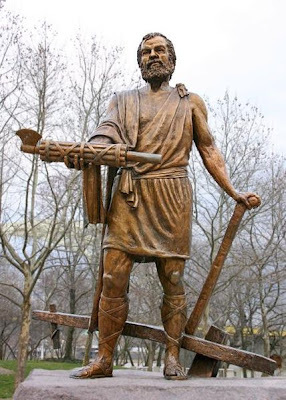 We have to understand this in the story of Cincinnatus because it is the hinge upon which Livy's history turns- and what we need to see in it is a critique of the contemporary senate that Livy lived with: they could not do this because they have turned from the soil and the sword to luxury and commerce. Cincinnatus's point is Livy's: forget money, the real determinant of the ability to command is ancient nobility and stern disciplined morality. The two run together and Livy is using the character of Cincinnatus to provide to modern times an example- a model- to behave like. This is a portrait with a contemporary relevance- Livy is speaking directly to the Augustan senators of Rome- Cincinnatus's words for Municius are meant to come down the century as an injunction to senators who lived hundreds of years later, and to make them reflect on the moral decline that has slain the Republic and left an Empire in its place.